There might be Team Tony and Team Carol, and there might even have been distractions like Hawkeye vs. Bruce Banner, but we’ve known from the get go that Civil War II would all boil down to one almighty clash: Iron Man vs. Captain Marvel. That major scrap might already be over though, if the latest issue is anything to go by. But then Carol steps in. Because Civil War II is nothing if not for making Carol Danvers an objectively obtuse villain whenever possible. Carol’s presence at the tense situation has sparked another huge vision from Ulysses, who visits the future apocalypse of the Old Man Logan timeline to receive a warning: Tony Stark pushed “her” too far, leading to, well, the end of the world. It’s pretty obvious that the “her” is Captain Marvel. It’s a bit of an awkward attempt at both-sides-ism in a conflict that, so far, has failed miserably to make Captain Marvel’s stance reasonable or Iron Man’s disagreeable. But before the Inhumans can warn Carol about a vision that is basically “hey, stop being a worryingly dystopian jerk, Carol”, things go sideways at Capitol Hill. One that looks has a lot of symmetry with the fatal blow that would lay James Rhodes low way back when Civil War II started. It’s like poetry, it rhymes, and so on. We know, thanks to recent issues of Infamous Iron Man and Invincible Iron Man, that after Civil War II Tony Stark has no corporeal form, his brain patterns “living on” as an advanced A.I. in the hands of his successor, Riri Williams. For all intents and purposes, he is dead. 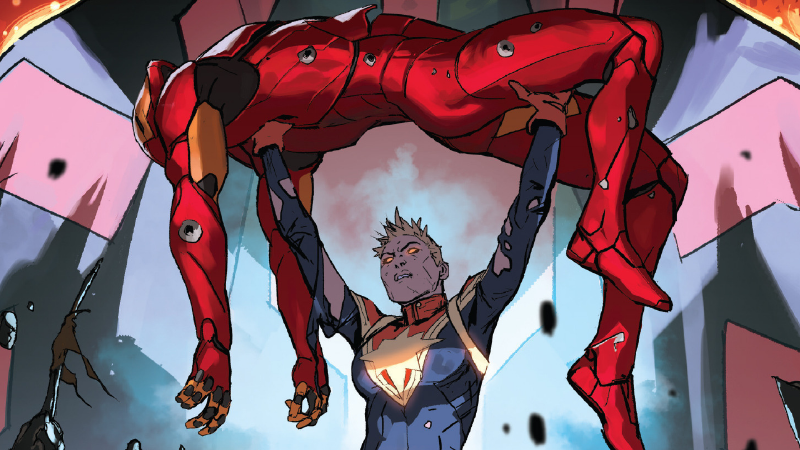 Considering the savagery of Carol’s attack—one that at least looks like it could completely eradicate someone’s body—this could be the moment that another iconic Marvel hero falls thanks to this event.